Make a sandwich of the crackers filled with peanut butter. Insert eight pretzel "legs" into the filling. With a dab of peanut butter, stick two raisin eyes on top. Makes 1 serving. Pour apple cider into all 5 small dishes, stopping about 1/2 inch from the top. Add 2 drops of red and 1 drop of green food coloring to each dish and stir until the colors have blended. Hang 2 or 3 gummy worms around the edge of each dish and place the dishes in the freezer. If you use more than 3 worms, the rotten apples won't float as well. Freeze until the rotten apples are solid. Just before serving, slip the frozen wormy apples out of the dishes by setting them briefly in a few inches of warm water in your sink. Float the rotten apples in a large punch bowl filled with untinted cider. 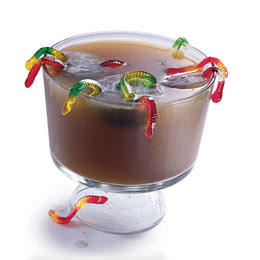 For added creepiness, drape the gummy worms over the edges of your serving bowl. If you are anything like me you sort of dread all of the treats and candy around Halloween, but try to remember this Healthy Eating Tip: There are no "bad" foods, only poor diets. A little extra candy and cookies on Halloween aren't "bad." You simply don't want to allow your children to eat too much of those foods, too often!